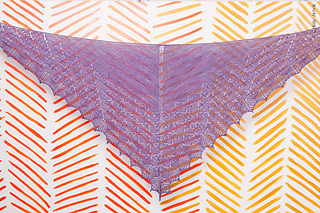 Antares is a triangular shawl that is worked from the top down, beginning with a tab cast on, and is shaped with increases worked on RS rows at both ends and on either side of the center stitch. 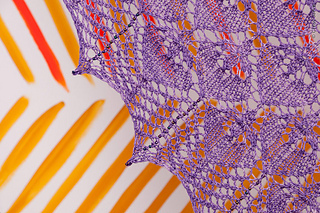 The beautiful Estonian lace stitch grows out of the garter stitch rows that form the top of the shawl. 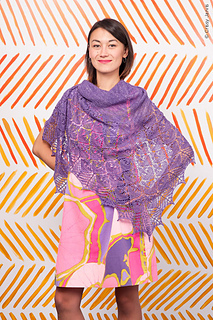 Shawl is finished with a delicate beaded border. Finished size: 56.75 x 36.75 (68.75 x 43, 81 x 43). Yarn: Lace weight; 550 (800, 1125) yards. Needles: US 5 (3.75 mm) circular needles. Crochet hook: US 13 (0.85 mm), used for placing beads. Skills: k2tog, ssk, yo, s2-k1tog-p2sso, centered triple decrease, 3-into-7 increase, tab cast on. Beads: 275 (350, 450) Swallow Hills Creations 8/0 seed beads in Purple Iris (optional).